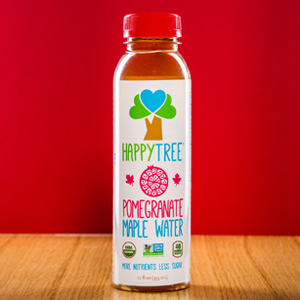 Happy Tree, which is a brand of high pressure processed maple water, has expanded their flavor lineup yet again. This time around it’s with a pomegranate flavor, something that appears to have the mainstream in mind. 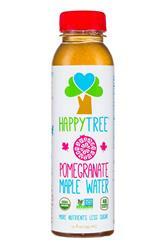 The product is a blend of three ingredients: organic maple water, organic pomegranate juice, and organic lemon juice. According to the label, the juice content totals nine percent; the pomegranate juice content is clearly pretty low as the liquid has only the slightest red hue to it. No matter -- we don’t think anyone will be consuming this to replace pure pomegranate juice. As far as the flavor goes, it’s light and very refreshing. The entire bottle has only 48 calories and 11g of sugars, but having only three ingredients creates a straightforward and clean flavor. The base of maple water works quite well, while added tartness from the pomegranate and acidity from the lemon create a balanced and well rounded flavor profile. The liquid is packaged in a 12 oz. cylindrical plastic bottle with a white label, which is the same as the rest of the Happy Tree family. They’ve refined their label a few times and this rendition is very clean and visually appealing. It features a top to bottom placement of the logo, flavor name, supporting images, and seals calling out their certifications and calories. Lastly, there’s a simple tagline of “more nutrients, less sugar.” Put all of this together and they’ve successfully created the vibe of a healthy, low sugar product. Overall, we really enjoyed this flavor and we’re pleased with the direction that Happy Tree is progressing. While maple water is still something that’s in its early stages, the brand is evolving and filling in its flavor profile quite nicely.